• Collate and review available information on the existing roads and planned improvements of roads within the site boundaries. • In consultation with the architects provide recommendations for the road network layout (road widths, turning radii and maneuverability). • In consultation with the architects develop the road hierarchy plans & typical sections, and the nature and form of internal junctions. • Receive and review topographic information for suitability to use in terrain modeling. • Build 3D terrain model of the development based on the 3D topographic survey data. • Perform Slope analysis to evaluate pre-development storm water runoff pattern. Identify site opportunities and constraints. • Develop site grading plan showing existing & proposed contours. • Grade entrances and exits, roads, parking and walking paths to maintain acceptable gradients including all outdoor amenities areas, landscaped areas. • Assist in determining finished formation levels for parcels/clusters. • Modify 3D terrain model to include new proposed levels in addition to existing ground levels. Review topographic survey information to understand the levels and gradients of the site in relation to road layout. 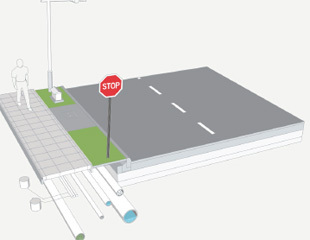 • Develop horizontal alignments of the required road corridors giving due regard to existing and proposed road levels. • Design & develop vertical alignments to optimize cut and fill. • Prepare junction designs and detailed road design plan & profile drawings and issue vertical & horizontal geometry stakeout report. • Prepare signing and pavement marking plans. • Determine a representative design load case (e.g. a standard axle). • Workout the number of equivalent design loads during the design life of the pavement. • Determine traffic load in terms of Million Standard Axles (MSA) in case of flexible pavement and Axle Load Distribution (ALD) in case of Rigid Pavement. • Design flexible pavement base course, binder course & wearing course at desire vehicle damage factor (VDF), Lane Distribution Factor (LDF) & specified growth rate at field CBR values. • Review and assess existing drainage infrastructure based on available records. • Collate available information on existing watercourses and their potential impact/ constraint on the proposed scheme. • Prepare hydraulic model including pipe networks and open channel flow model to manage peak storm events and mitigate flooding risk. • Integration with land use plan to allocate space for site-wide drainage corridors and setbacks. • Develop Plan & Profile of storm drain network. • Develop rainwater harvesting plan indicating potential rainwater harvesting techniques that can be used on site. • Provide design details of all structures required for storm water such as manholes, inlet structures, grates, gutters, drop structures, etc. • Determine the appropriate water distribution network after a water balance study, and create all the necessary drawings for laying out the water collection, filtration and distribution system. • Design a comprehensive waste water collection system with both the network and treatment systems. • Design a comprehensive electrical distribution network with transformer yards, feeder pillars, HT and LT lines and street lights. • Prepare appropriate utility coordination drawings with electrical and telecommunication ducting systems and conflict lists. We prefer to work with the local contractors for the electrical system design. 1. Invicus will obtain relevant hydrological data and conduct a hydrological analysis of the watershed for the area and any influencing lakes and model the ultimate flows through the proposed channels. 2. Invicus will then conduct a complete hydraulic analysis of the channels including a hydraulic sizing of the channels and determine the safe finished grade using state of the art tools and modeling software. 3. Invicus will prepare a detailed report documenting the findings and determining the various hydraulic parameters to be used for final design. 4. Invicus will prepare the alignment, plan and profile drawings, cross sectional drawings, details and BOQs of the channel including the introduction of various hydraulic appurtenances like silt traps, stilling basins (if required) and trash tracks. 5. Invicus will determine the FFLs of your development based on drainage patterns within the property. 6. Invicus will coordinate with the landscape team and infrastructure team to ensure that there is design synergy. 7. Invicus will liaison with the various entities concerned and provide inputs to assist with approvals. 8. Final inspection of design implementation.